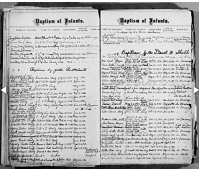 This collection consists of parish registers, with records of baptisms, marriages, burials, and communions, in addition to lists of members, pastors, and church officers. The originals, most of which reside at the individual churches, were microfilmed and now digitized to extend easier access to these valuable records. Currently, only records from Lexington County are available. We will continue to add counties. Please check back for additions.